When it was announced that Joseph Gordon Levitt would play a Gotham City Police Officer named John Blake in The Dark Knight Rises, speculation was rampant about who he really was. Robin, Azrael, the Riddler, Hugo Strange, Black Mask, the Joker, Alberto "Holiday" Falcone, Catman... lots and lots of guesses. Baseless, baseless guesses. Now that the movie's been released, we all know his purpose, but we'll keep this review as spoiler-free as we can. What we will talk about is how good his action figure is. 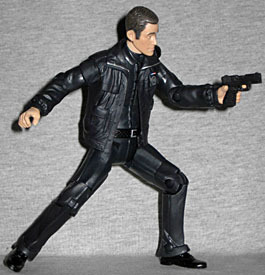 We got a JGL figure as Rex "The Doctor" Lewis in the GI Joe: Rise of Cobra toyline, but that figure had a disfigured face and was done in a 3¾" scale. Mattel gives us an unscarred JGL, done in their, uhm... 6"? 5.5"? ...What the hell scale are Movie Masters in anyway? Whatever. They give us an unscarred JGL done in their usual Movie Masters scale, which means not-quite-as-tall-as-DCUC-for-some-stupid-reason. And it really looks like him. Before he arrived at my doorstep (thanks Walmart.com!) I had seen pictures of the figure online, and wasn't terribly impressed. 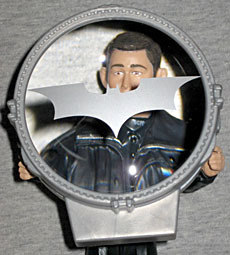 In person, however, it's pretty remarkable how well Gordon-Levitt's likeness was captured in plastic. The shape of the eyes, the size of the mouth, the jut of the chin...it looks just like him. The rest of the figure's not too bad either. Blake combines new parts with old, utilizing the same pants, shoes and shirt pieces that every "suit-wearing" figure in the line has used, from the Gotham City Thug to Scarecrow to Harvey Dent to Two-Face to Commissioner Gordon to Alfred and on and on. The legs are decent, and actually appear less "pigeon-toed" when the articulation is lined up so the sculpted creases match up, unlike the previous suited figures. The torso is slightly retooled, removing the tie piece and adding a separate undershirt collar peeking out of the button-up shirt collar. The new parts include the excellent head sculpt, newly tooled arms and a soft plastic "jacket" vest piece that goes over the torso. 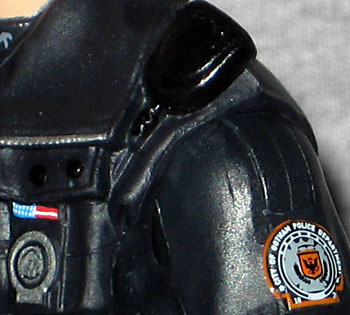 There are some nice detailed elements, including the shoulder-mounted radio with the sculpted cord, the badge and the patch on his shoulder. 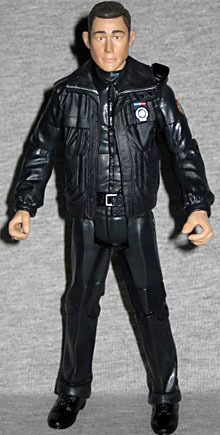 The arms and jacket are nice and bulky, with lots of sculpted wrinkles to portray the jacket's bagginess. The hands are also new, although I'm not really sure why that is exactly, since he doesn't come with anything to hold. The paint is simple but effective. The skin on his face is molded in flesh-colored plastic, while his hands are painted. His hair and eyebrows are a nice dark brown, while his eyes are a lighter brown, which is a nice touch. His outfit is mostly deep blue-gray, nearly black, with some silver highlights on his badge, zippers and belt buckle, a gloss black for the belt and shoes, and a nice satin black for the radio piece. There's a little American flag motif above the badge that's very nicely done in red, white and blue, and the patch on his shoulder is full of minute detail, including tiny text that says "City of Gotham Police Department." It's difficult to read because it's so tiny, but it's there. His articulation is exactly the same as every other figure featuring this basic body, which is to say it's very nice: balljointed neck, peg and hinge shoulders, peg bicpes, hinged elbows, peg wrists, hinged torso, peg waist, Mattel style hips, peg thighs, hinged knees, and hinged ankles. As mentioned above, Blake doesn't get anything to hold in his hands. It's pretty sad that he doesn't get a gun, since he uses one several times in the film, and the gun tooling already exists (it came with the Movie Masters Commissioner Gordon figure - both of them.). Blake only comes with his Bat-Signal piece. It's the main lens, an unbroken version of what came with the Walmart-exclusive Commissioner Gordon. Interestingly, the actual "bat" of the signal is a painted element, not sculpted. I attaches nicely to the main light assembly that comes with Alfred. Blake is a good figure with lots of new tooling. He looks just like Joseph Gordon-Levitt, and he's a pretty good generic cop figure as well. It's a shame he doesn't get a gun, and it's also difficult to use this figure with any other lines that feature a different scale (which is to say, almost all of them), but the fact is if you want to complete the Bat-signal (and who doesn't?) you'll need this guy.